I can’t be the only gardening parent out there who is hoping to inspire a lifelong love of gardening in my munchkin. For her sake (because gardening is amazing). And also for mine (because so many reasons). So, in the interest of motivating a future partner in weeding, I’ve been spending a lot of time research gardening gifts for toddlers. And wow, there’s a lot of fun stuff out there! In the hopes of saving you a bit of shopping time, I’ve collected the best of the lot here, where you can explore some of 2017’s best gardening gifts for toddlers. Because, less time shopping means more time for gardening and chasing after that toddler. And those are two things every garden-loving parent needs! Some of these we own. Some we are about to own. All look like they’d be amazing toys for kiddos in the roughly 1-4-year-old range. Of course, every munchkin is ready for new toys on her own timeline. So, adjust as would suit your own little future gardener. And check back over the next few days — I’m working on garden-inspiring gift guides for babies, little kids, and big kids too. The basic tools of gardening are also the basic toys of gardening. Every future gardener deserves a good set of ready-for-real-dirt garden tools. The best of the lot (in my opinion) are solid and robust plastic (because metal rusts and toddlers seem to get everything wet. My absolute favorite is the great little watering can, rake, and hand trowel from Green Toys. This set actually works! The rake rakes. The trowel trowels. And the watering can really and truly waters (unlike so many toy watering cans that just leak and dribble). The whole kit is made of 100 percent recycled plastic in the United States. But don’t take my word for it — check out the reviews on Amazon, where people are raving. This is where I should admit my great adoration for the classic little red wagon by Radio Flyer. It’s just so darned cute. Useful, too. Your munchkin (or you!) can pile this wagon high with dirt or pebbles or pots of flowers and veggies, and then pull it all around the yard or garden. There’s a mini version of Radio Flyer’s classic red wagon, if you want one that’s just right for the kiddo. And there’s also a more utilitarian version too, with big wheels that are perfect for off-roading. And, if you’re more of a wheelbarrow family, Radio Flyer now offers an adorable little tot-sized wheelbarrow. Other building and spatial-relation-themed garden-inspiring toys that caught my eye include the wood-and-fabric Hape Garden Stacker (so cute! ), and the Green Toys Garden Puzzle. Bugs are a fact of life for every garden and gardener. Plant an early fascination for the creepy crawlies with a bit of bug-themed fun. There are almost too many options to choose, but these three are tops of my list. Shapes and colors and even numbers are all incorporated into Hape’s bug-themed wooden shape sorter. And, let’s be honest, every toddler loves a push-around toy. 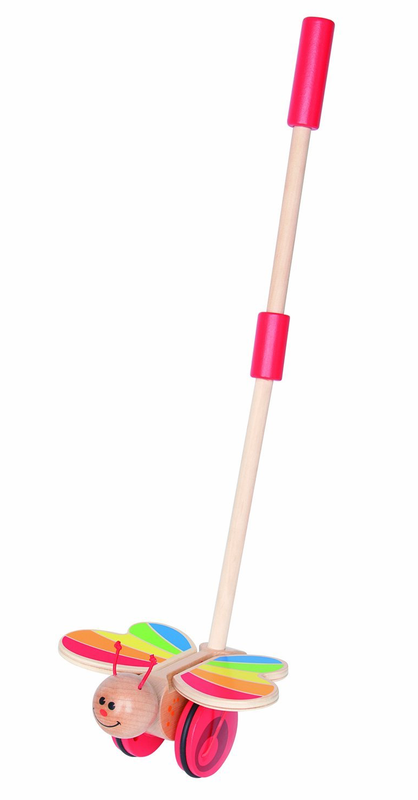 Might as well make it an adorable butterfly push-around toy, like Hape’s Wooden Butterfly Push and Pull Toy. But it’s the Learning Resources Take 10 Color Bug Catcher game that’s got me really excited. I come from a family of happily competitive game players, and I love the idea of getting the kiddo started early with a game that helps her learn her numbers and colors, reinforces sorting, and encourages comfort with bug and critters. Encourage your partner in planting to grow some veggies or flowers of her own with these fun pretend (or real!) planting toys. 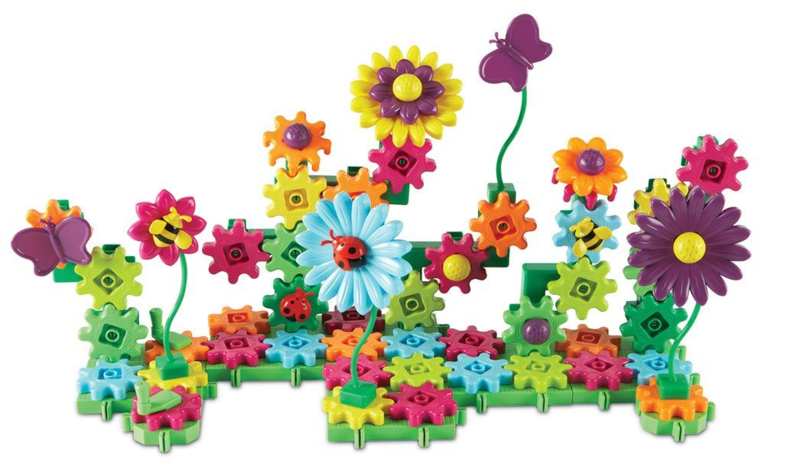 I predict many fanciful flowers from the Green Toys Build-a-Bouquet Floral Arrangement Playset (another made-in-the-USA-of-recycled-plastic winner from Green Toys). And, I absolutely love the fact that the Little Tikes potting table can be used with pretend flowers, or filled with real dirt for some real planting projects. Learning Resources offers a nice little set of pretend-to-grow flowers and veggies that should work nicely with the Little Tikes potting table or own their own. Bring it all together in the kitchen! There are gobs of reasons to get toddlers involved with cooking, but it’s especially fun and inspiring when the cooking features homegrown veggies. Give your munchkin a boost with a step stool or learning tower. We have the Growing Step Stool by Little Partners, and it’s perfect for our petite kitchen. The kiddo uses it as a seat, a stool, and a staging area for all manner of imaginary play. It’s also slim enough to be tucked out of the way when it’s not needed at the sink or counter. Ours is green, but there are seven fun colors to choose from. Highly recommended! If we had a larger kitchen, we probably would have gone for the larger Learning Tower, also by Little Partners. It has a broader and deeper platform, and features safety rails all around. We haven’t had a falling incident with our step stool, but this would certainly be more secure. As with the Growing Step Stool, there are seven color options. Once the munchkin is at counter height, you’re ready to get cooking! It’s great to include the wee ones with real food prep, but this set from Battat toys gives her the freedom to “cut” her own veggies (and gives you a break from supervising real-food play). The kit includes a variety of fruits and veggies, as well as a basket, toy knife, and cutting board. The food pieces are all two pieces held together with velcro, so your toddler can practice her knife skills. We have several sets like this, and my kiddo will happily cut each produce unit into two before pretending to cook up a yummy soup of tomato and pineapple and corn (or whatever else strikes her fancy). 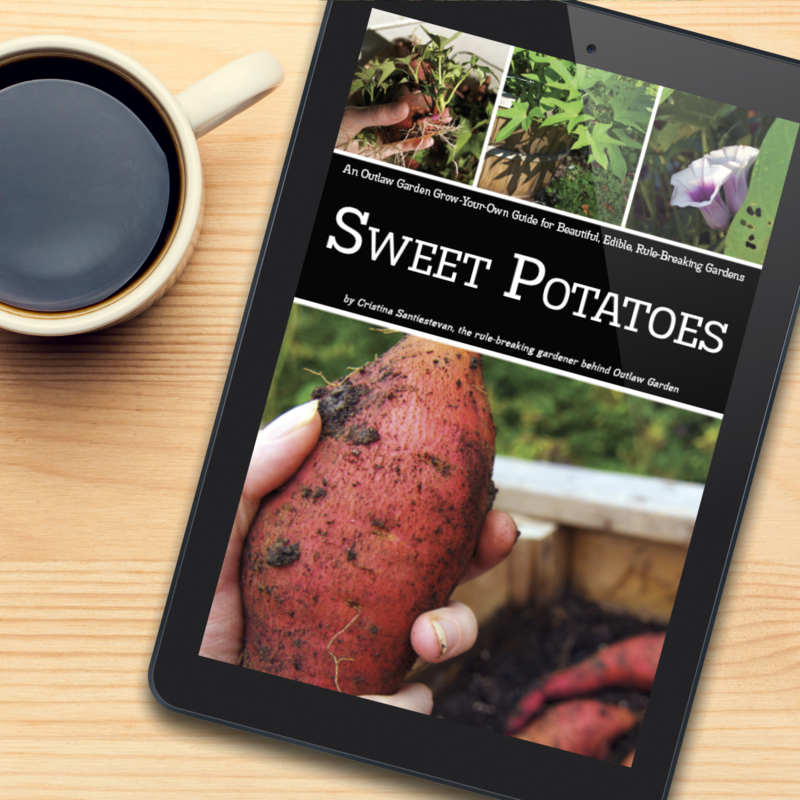 What Are Your Favorite Gardening Gifts for Toddlers? These are the items that have most caught my eye this year, but surely there’s more out there. What’s on your kid’s (or your) wishlist this year? (Or, if you’re past the toddler years, what worked or didn’t?) Please share your thoughts and recommendations for must-have gardening gifts for toddlers in the comments section. Thank you!